Navigation + Wi-Fi On Demand, packed with travel-friendly features, is now available at most airport locations. 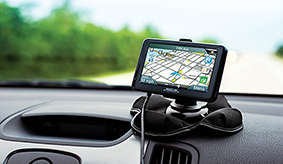 This includes a GPS function and Wi-Fi availability. Whether it’s making calls on-the-go, finding the best restaurants in a new city or just finding your way around, the Navigation + Wi-Fi On Demand is all you need to make your travel experience easy and enjoyable. If visiting one of Hertz’s other non-major markets, also available as an addition to your rental is the Navigation Only device (GPS function only). 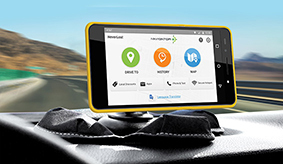 Portable Mode: Take the Hertz Navigation + Wi-Fi On Demand options wherever you go. The portable mode makes navigating a destination on foot and accessing other features out of the car easily. Discounts**: Get discounts to attractions and stores that are available to Hertz the Hertz Navigation + Wi-Fi On Demand options customers.